Commentator/Courier Photo by Justin Seward The Riverview Golf Course is off to a great start despite the massive debt they faced this past year. Redcliff’s Riverview Golf Course opened for the 2019 golf season on April 3 and hopes to put last fall’s turmoil behind it. “Everything is going pretty good so far,” said new general manager Doug Braithwaite. The club did not know if it would be open for another season as last October it was made known during an open meeting that the golf course was $405,000 in debt. Golf course board members sought to raise $100,000 by asking community members for $500 donations to start paying off the debt. By the conclusion of the second meeting, a motion was put forth by the board to form a committee to keep the golf course alive. 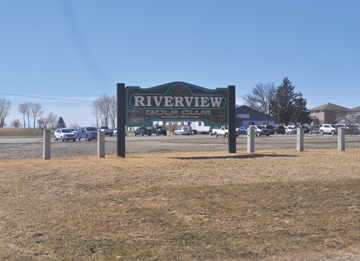 A new executive came on board in January, including a former Redcliff mayor, Bill Duncan, along with Cliff Sackman, Darrel Schafer, Gerry Beach, Cody Booker and Russ Paulson, who informed the public that the 2019 golf season at Riverview would go ahead. The group was able to put a viable business plan together that Redcliff town council approved at a January meeting. Council told the new executive they would reach out to their banking contacts to help fund the golf course. Town administration was asked by council to put together a borrowing by-Law which was presented at the next council meeting. Council voted Jan. 28 in favour of providing the course with a $315,000 loan to stay afloat. “Our volunteers and our board really took the bull by the horns to make sure this place was viable,” said Braithwaite. Braithwaite, who was a former assistant pro at Riverview from 2008-2011, before leaving the seasonal work, was encouraged by members to look at the general manager position. “Our goal is to increase golfers around here,” he said. Programs offered this season include the junior program, men’s (Wednesday nights) and women’s (Tuesday nights) will start in May, a skins game will be played on Sunday mornings as well as Nine and Dine for members and non-member couples to come out and play nine holes and enjoy a meal. Memberships are sitting at 160, with a goal of 200, he added. More information can be found at http://www.golfriverview.com.